The Rolling Stones have unveiled the details of their next album, ‘Shine A Light’, to be released by Universal Music / Polydor. The album is from the Martin Scorsese-directed concert film ‘Shine A Light’ and will be released simultaneously with the movie. From the unmistakeable opening riff of ‘Jumping Jack Flash’ to the classic sounds of Tumbling Dice, Sympathy For The Devil, All Down The Line and Start Me Up plus some unusual gems from the Stones catalogue - ‘You Got The Silver’ and ‘Faraway Eyes’ - ‘Shine A Light’ will be released on 7 April 2008. Included are three stunning collaborations - with blues legend Buddy Guy on ‘Champagne and Reefer’, Jack White from White Stripes on ‘Loving Cup’ while Christina Aguilera duets with Mick Jagger on ‘Live With Me’. 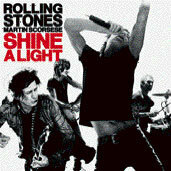 ‘Shine A Light’ will be released on double CD worldwide with a single disc version available in the US. ‘Shine a Light’ is a 22 track Rolling Stones live double album recorded during two memorable nights at New York’s Beacon Theatre in 2006. Produced by The Glimmer Twins and mixed by Bob Clearmountain, Mick Jagger, Keith Richards, Charlie Watts and Ronnie Wood are supported by their long-standing backline including bassist Darryl Jones, Chuck Leavell keyboards, Bobby Keys on saxophone, backing vocals Lisa Fischer, Blondie Chaplin and Bernard Fowler, and the horn section - Tim Ries, Michael Davies and Kent Smith. Martin Scorsese’s Shine A Light film recently kick-started the Berlin Film Festival to widespread critical acclaim and receives its New York premiere on March 30 and European premiere in London on 2 April. UK Cinemagoers will have the chance to experience a Stones concert as never before - as the fifth member of the band, from the front row and from behind the scenes. No stranger to rock concert films, Scorsese filmed the Stones over a two-day period at the Beacon Theatre in New York City. With performances from Buddy Guy, Jack White of the White Stripes and Christina Aguilera, and integrated with rarely seen archival footage, Shine A Light is a unique cinema experience. Twentieth Century Fox will take the ultimate Rolling Stones concert film from Oscar- winning director Martin Scorsese to over 100 cinemas nationwide on 2 April via satellite link for simultaneous premieres alongside the London Leicester Square opening. For more details visit Shinealightmovie.co.uk. Tickets on sale from 7 March. ‘Shine A Light’ the album is released on Polydor/ Universal Music on 7 April 2008. Jumping Jack Flash ,Shattered ,She Was Hot, All Down the Line ,Loving Cup (with Jack White) ,As Tears Go By ,Some Girls, Just My Imagination, Faraway Eyes, Champagne and Reefer (with Buddy Guy), Tumbling Dice ,You Got The Silver, Connection. Sympathy For The Devil ,Live with Me (with Christina Aguilera), Start Me Up, Brown Sugar, (I Can’t Get No) Satisfaction, Paint It Black, Little T&A, I’m Free, Shine A Light.